Start your February winning streak at Jackpot Capital Casino with a daily 100% match bonus up to $200 free and double comp points for the Stardust slot! Redeem the coupon code 19GOTM2 once a day in February to claim your free bonus to play your favorite online slots. 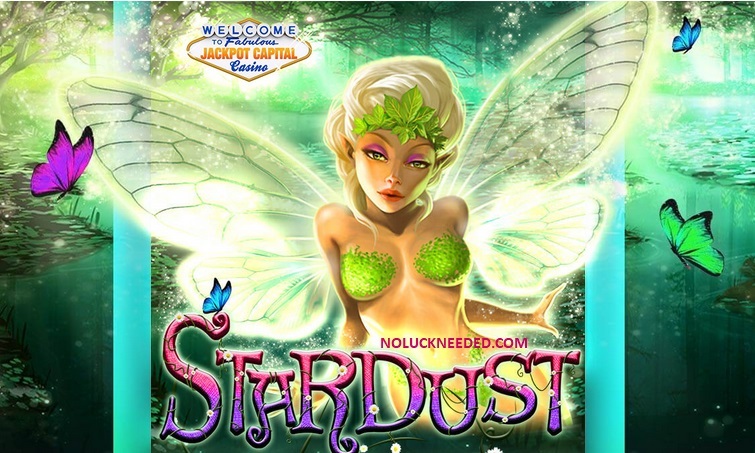 You will also earn double comp points this month when you play the magical Stardust slot game. Don't forget to check the casino message center for Valentine's day free chips and bonuses this month. Good luck! CLAIM DAILY! NO Maximum Cashout; Standard bonus terms apply. The maximum bonus amount is $200. $45 minimum deposit. 30X deposit +bonus wagering requirement. Validity: Once per day until 28 February 2019. This February, discover the home of our fairies when playing our Game of the Month, Stardust! Spin the reels and discover all of the Fairies, Mushrooms, Crystals and treasure hidden deep in its fores! Claim Your February Bonus Codes and Play Stardust at Jackpot Capital Casino! Choose from two Deposit Bonuses as well as two Free Spins Coupons. All four bonuses are valid from Feb 12 - Feb 14, once a day. Additionally, we'll reward you with 50 Free Spins on Ritchie Valen's La Bamba for depositing today!